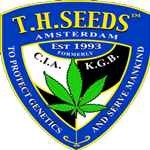 T.H.Seeds was established in 1993, making it one of the oldest seed companies in Holland. It began in the C.I.A. (Cannabis In Amsterdam), which was a Cannabis information center, that was a world renowned seed shop,the first hemp store in Europe and, according to Robert C. Clarke (author of: Marijuana Botany, HASHISH! ), \"The epicenter of the Cannabis universe.\"
T.H.Seeds quickly gained an excellent reputation among the experienced growers who purchased T.H.Seeds. Most comment on how pleased they are with the consistency and quality of the T.H.Seeds genetics. This positive feedback from the growers themselves is the solid foundation on which T.H.Seeds has been built.